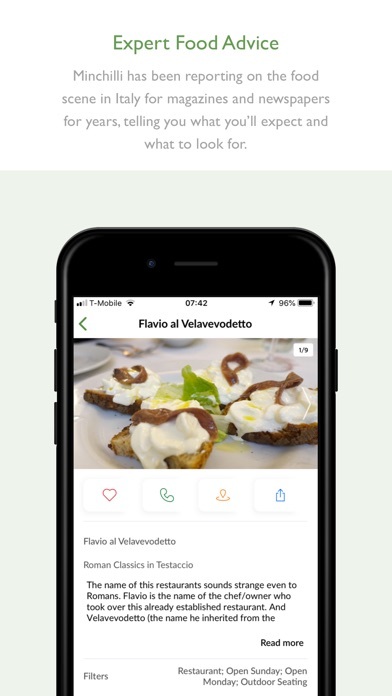 ****The Foodies Guide to Italy**** Version 2.0 This new version of the best-selling Eat Italy has a completely redesigned interface that gives you the information you need on a clear and beautifully designed platform. It offers improved mapping, navigation, search and filtering, sharing and offline downloads. 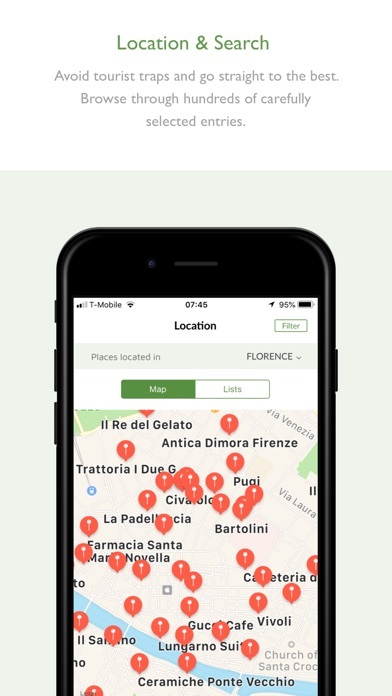 Download this latest version of the app to get access to the most up to date information of delicious places to explore in Italy. “Savvy advice for the traveler to Italy” USA Today “It was a kind of experience you just don’t get if you’re wandering around by yourself,” The New York Times “Expert advice on how to eat and shop in Rome” The Wall Street Journal “My favorite expert on all things edible in Italy is Elizabeth Minchilli” Huffington Post Travel Italy is one of the great tourist destinations in the world. Renaissance palaces, Rome’s Colosseum and Michelangelo’s David draw millions of visitors a year . But tourism has its price, and finding authentic restaurants, bakeries and gelaterie is a challenge. With Elizabeth Minchili’s EAT ITALY in your pocket you’ll be sure that every morsel of food you put in your mouth while you’re in ITALY is the best. 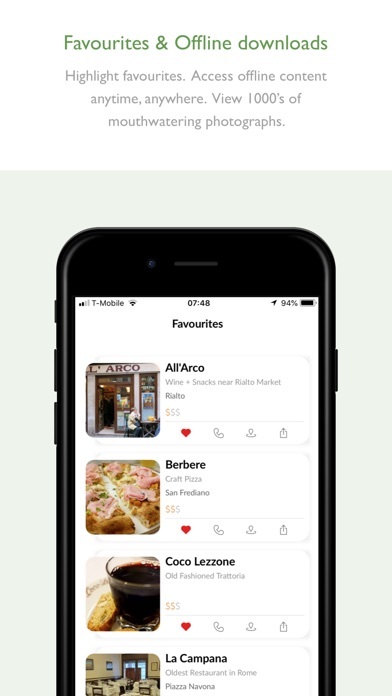 HOW THIS APP CAN HELP YOU: EXPERT FOOD ADVICE: Minchilli has been reporting on the food scene in Italy for magazines and newspapers for years, and is the go-to source for insiders. MORE than just restaurants, you’ll find bakeries, wine bars, food stores, hotels and more. MORE lively and opinionated content. Minchilli lets you know the score, telling you what you’ll expect and what to look for. DELICIOUS picks in ROME, VENICE, FLORENCE, MILAN and more cities and regions. UPDATES: Minchilli is always working on this app! Both the content and the software are always kept up to date. New restaurants and new cities and regions are always being added. PRAISE FOR MINCHILLI AND HER EAT APPS: Travel & Leisure: “Top Italian Food Guide App” Huffington Post: “The go-to food app to help me eat better.” Los Angeles Times: “Thank goodness for Elizabeth Minchilli’s apps.” The New York Times: “A local expert who brings the hungry to hidden culinary landscapes.” Frank Bruni, New York Times: “Trust me, no one knows food in Rome like Elizabeth does.” WHAT CAN I DO WITH THIS APP? Avoid tourist traps and go straight to the best Browse through hundreds of carefully selected entries. 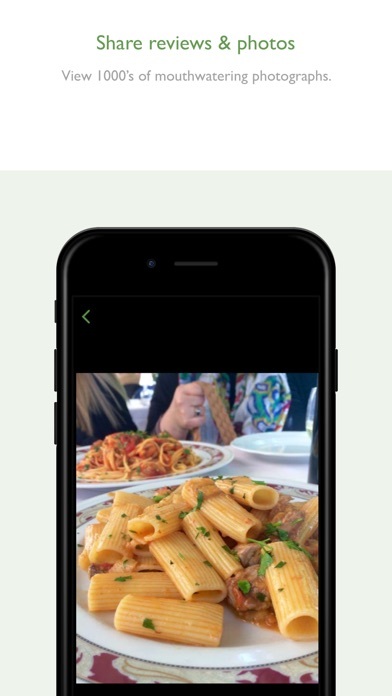 One click website links go directly to the source Share reviews and photos Highlight favorites See what’s near you and navigate your way to your next meal Access offline content anytime, anywhere. View 1000’s of mouthwatering photographs. 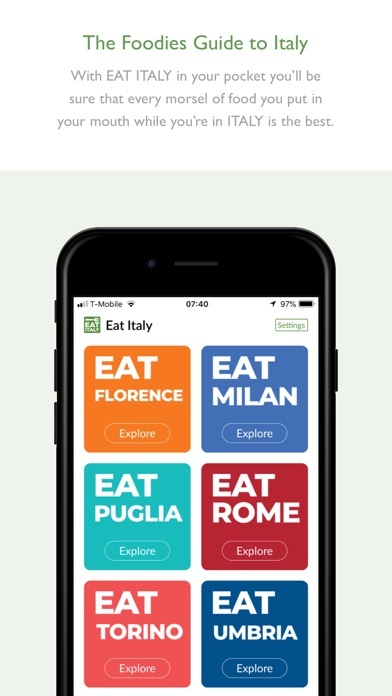 EAT ITALY is a free app. Rome, Venice and Florence are available as in-app purchases. The remaining and ever-expanding cities and regions are completely free of charge. ***About the Author*** Elizabeth Minchilli has been eating her way through Italy her entire life. She is the author of nine books on Italian living, including Eating Rome: Living the Good Life in the Eternal City and her most recent Eating My Way Through Italy. Her app, EAT ITALY, has remained a best-seller on iTunes since it was first published in 2010. She has contributed to over forty magazines and newspapers including Bon Appetit, Food & Wine and The International Herald Tribune. She writes about all the good and delicious stuff on her blog, Elizabeth Minchilli in Rome. You can follow her on Instagram eminchilli. I live in Umbria and use the guide as a quick check when I am in a different city/town from those I am used to visiting. of course, I have my own favorites, but Elizabeth has uncovered some interesting gems like La Cuccola which we recently visited and enjoyed very much. That is where this comes in especially handy. I paid for the Rome app and did not receive it. I received notice from Apple Pay that it was paid but cannot use the app. I had used Eat Rome several years ago when it was a stand-alone app and it worked reasonably well and gave great recommendations. Unfortunately, within the Eat Italy app things never worked! I had to re-purchase Rome (annoying but somewhat minor) and every time I tried to use the location section, in either the list or map view, it would only give me Florence! Even though I was in the Explore Rome section of the app. This happened over and over again and I could never get to the Rome map. I also tried downloading the Rome section so that I could use it offline and it wouldn’t download, despite quitting the app and multiple attempts. Finally just switched to reviews on google and had a great experience. It is too bad since past recommendations had been good. This is perhaps the worst app I have ever purchased. I paid for both the Rome and Venice guides. Neither has ever worked properly. Each city results in a blank page. I have tried reloading the app, restoring the purchases. Occasionally one city page description will appear but the places are always listed as “0”. And of course, there is no app support. Save your money and peruse the blogger’s website instead. The app is a bit buggy, but the recommendations are spot on and worth the bit of extra time it takes to navigate the app. I used her Venice map—so worth the minimal cost! I ate at a lot of places I wouldn’t have otherwise. It’s a wonderful way to experience Italy for foodies! Simply put, the app won’t remember which cities were purchased and there is no support whatsoever. I appreciate Elizabeth’s recommendations but this app simply doesn’t work. This is one of the worst apps I have purchased. It doesn’t do anything other than give you a list you can get anywhere for free. Love it! Looking forward to using it next month in Rome! 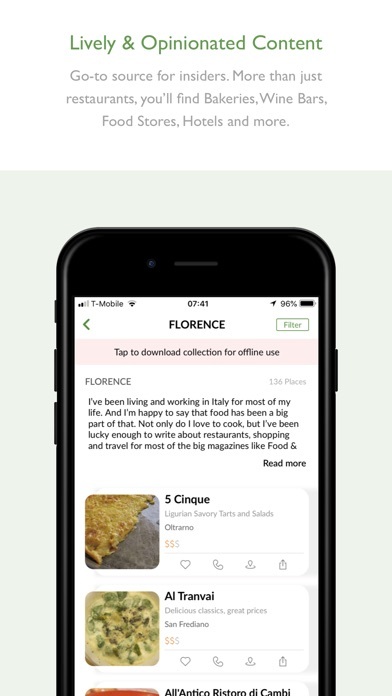 I read everything I can about Italy and food and am so glad to have the app where all Elizabeth’s experience is condensed in an app format to take with me. On a visit 7 years ago, I had clippings and ripped pages from books to consult but her updated app is so accessible and personal. Great companion to her new book which I have also downloaded to my iPad. Easy to use. It will take you to wonderful places the other guides miss.